Ross Barkley has scored a delightful free-kick wonder-goal to make it 2-0 to Chelsea against Malmo in the Europa League this evening. 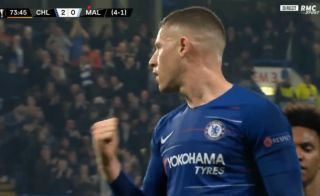 The England international hasn’t always been Chelsea’s most convincing performer this season, but showed his immense potential with this superbly-struck effort into the back of the net. Chelsea are now 4-1 up on aggregate against Malmo, having won 2-1 away from home in their first leg encounter last week.